BBC Sport outlines the promotion and relegation issues in England and Scotland - plus the race for European places. 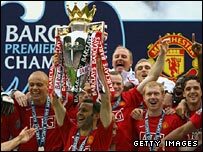 Manchester United retained the Premier League title by beating Wigan 2-0 in their final game. Runners-up Chelsea, who could only draw 1-1 with Bolton, have qualified for the Champions League, as have third-placed Arsenal and fourth-placed Liverpool. Everton will take part in the Uefa Cup next season after finishing fifth in the table, as will FA Cup winners Portsmouth and Carling Cup winners Tottenham. After England topped Europe's fair play rankings, an additional Uefa Cup place was awarded to the best-behaved Premier League team that has not already automatically qualified for Europe - and Manchester City were the team to qualify. Sixth-placed Aston Villa are set to enter the Intertoto Cup, whose winners also qualify for the Uefa Cup. FULL GUIDE: Who has qualified for Europe? Derby were the first club in England to be relegated when they drew 2-2 with Fulham on 29 March, and they will be joined in the Championship by Reading and Birmingham, who both went down on the last day of the season despite winning their final games. 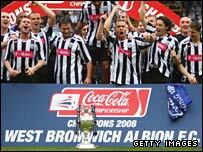 West Bromwich Albion are up as champions and will be joined in the Premier League next season by Stoke. Hull, who missed an automatic promotion spot, defeated Bristol City 1-0 in the Championship play-off final. The relegated teams are Leicester, who went into the drop zone on a dramatic final day, Colchester and Scunthorpe. Swansea clinched promotion by beating Gillingham on 12 April, and won the title a week later. The second automatic spot went to Nottingham Forest. Doncaster secured their place in the Championship next season with a 1-0 win over Leeds in the play-off final at Wembley. Four teams are relegated from this division. Luton and Port Vale both went down on 12 April, while Gillingham and Bournemouth joined them on the last day of the campaign. Milton Keynes Dons and Peterborough secured promotion on 19 April. 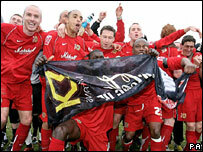 Hereford joined them on 26 April, when Milton Keynes also clinched the title with victory over Bradford. Stockport joined them by beating Rochdale 3-2 in the play-off final. Wrexham were relegated on 22 April and Chester's draw against Stockport on 29 April meant that Mansfield also drop out of the League. 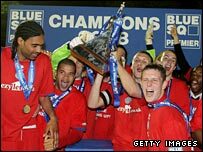 Aldershot clinched promotion to the Football League as champions on 15 April, and Exeter claimed the second and final League place by beating Cambridge United 1-0 in the play-off final at Wembley. At the bottom, Droylsden, Stafford Rangers and Farsley Celtic are relegated - with Altrincham handed a late reprieve as Halifax Town are on the brink of liquidation and have not been placed in the top four levels of non-league football for next season. Four teams are promoted to the Blue Square Premier - Blue Square North champions Kettering Town and play-off winners Barrow, and Blue Square South champions Lewes and play-off winners Eastbourne Borough. The SPL title race was settled on the final evening, Thursday 22 May, with Celtic's 1-0 victory away to Dundee United ensuring a third title in a row for Gordon Strachan's side. Rangers had started the evening equal on points but behind on goal difference but lost 2-0 away to Aberdeen to finish second. Celtic go straight into the Champions League group stages next season, but Rangers now face two qualifying rounds. Motherwell qualified for the Uefa Cup by making sure of third place, which was confirmed when rivals Hibernian lost 2-0 at Celtic on 11 May. Struggling Gretna's relegation was confirmed on 29 March when they lost 2-0 at St Mirren. They will be the only team to go down - on 29 May, the Scottish Football League decided to relegate them a further two divisions to Division Three, and on 3 June, they resigned from the SFL completely. 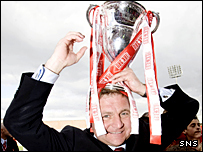 Hamilton Accies secured top spot and promotion to the SPL with a 2-0 victory over Clyde on 19 April. Scottish Cup losing finalists Queen of the South will enter the Uefa Cup, despite losing the final - because winners Rangers had already qualified for the Champions League. Stirling Albion were relegated following their loss at Partick Thistle on 8 April. Clyde finished ninth - but avoided the drop to Division Two after beating Second Division sides Alloa Athletic and Airdrie United in the play-offs. 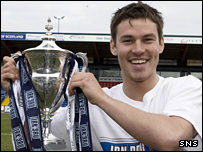 Ross County wrapped up the Second Division title on 5 April by thrashing already-relegated Berwick 4-0. Airdrie United lost to ninth-placed Division One side Clyde in the play-off final, but have been handed an extra promotion place because of Gretna's demise. Bottom club Berwick Rangers were consigned to relegation on 29 March when they drew 2-2 with Peterhead. The ninth-placed team - Cowdenbeath - were relegated on 3 May after losing their play-off semi-final against Arbroath, who were fourth in Division Three. 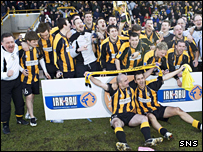 Champions East Fife were the first team in Britain to win a league title when they won 3-0 at East Stirlingshire on 15 March. Arbroath finished fourth but won promotion after a two-legged play-off final against Stranraer, who were granted an extra promotion place because of Gretna's demise. There is no relegation from this division, but East Stirlingshire avoided finishing bottom for the first time in six years with a final-day win over Montrose. That left Forfar Athletic as the worst team in Scottish senior football this season. The SFL set a deadline of 12 June for prospective new clubs to apply to fill the vacancy in Division Three caused by Gretna's demise - and member clubs will vote on the matter on 3 July. Five clubs - Annan Athletic, Cove Rangers, Edinburgh City, Preston Athletic and The Spartans - have all lodged applications. Who has qualified for Europe?